Recently, I visited the Bergamot Station galleries and had the good fortune to catch two excellent photography shows. However, the only thing these two exhibitions had in common was the medium. One show was in black-and-white; the other was in color. One show emphasized the sheer majesty of the natural world; the other delighted in the playful distortion of its subject matter. 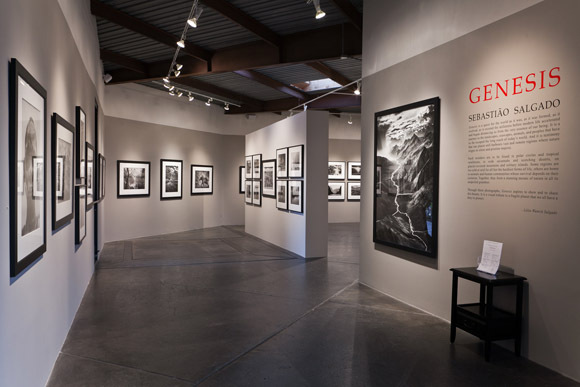 The first show, located in the Peter Fetterman Gallery, is titled “Genesis” and is the first public U.S. show of photojournalist Sebastião Salgado. “Genesis” features a combination of black-and-white nature photography interspersed with photographs of isolated communities of people living off the land and herding animals. The nature shots are, in a word, sublime. They are absolutely awe-inspiring and magnificent. Salgado has breathtakingly captured snow-covered mountain ranges, winding rivers, sweeping plains, and other parts of nature and imbued them with a truly magical quality. The black-and-white medium gives each photograph a dramatic, cinematic quality. 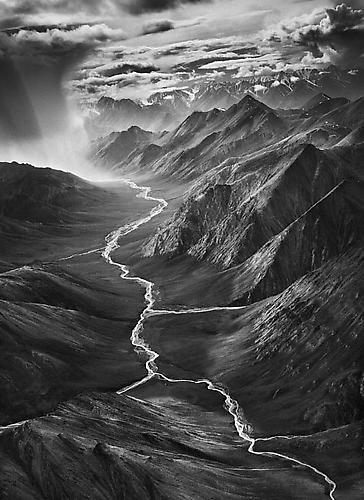 The different textures Salgado has captured—rough mountains, soft, fluffy clouds, lustrous bodies of water—are incredible. As I’ve become more acquainted with black-and-white photography, I’ve noticed that this medium really allows for the appreciation of textures and how they interact and contrast, since my eye is not distracted by the use of color. An early photograph in the show depicting part of the Arctic National Wildlife Refuge (reproduced below) is especially grand, combining a mountain range with a winding river and a burst of pure sunlight amid thick, puffy clouds. In several of the works on display, the sun bursts through cloud layers, glowing with a heavenly, cinematic light. Oceans, plains, mountains with snow, and unbelievable cloud patterns present our earth in a reverent way. I could not tear my eyes away from the imges. The contrasts are gorgeous-black and-white, sharply delineated mountains against sweeping soft clouds (best seen in a photograph of the Kamen Volcano and the Kluchevskoy Volcano in Russia). Some true highlights of this show are the works “View of the confluence of the Colorado and the Little Colorado from the Navajo territory”, “Macaroni Penguins on Zavodovski Island…” and “Iceberg between Paulet Island and the South Shetland Islands on the Weddell Sea. Antarctic Peninsula”. The latter, which depicts a huge glacier floating on an inky black sea, caused me to gasp aloud in the light of its ethereal power. Each picture is a story worth a thousand words of description, or in a case where a photograph depicts the human element, a thousand words of narrative. 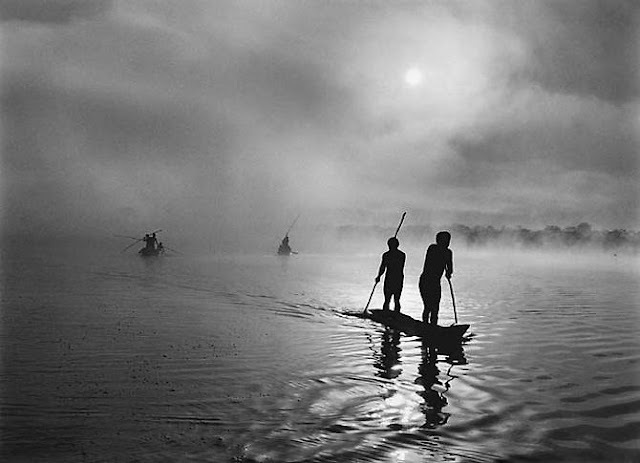 A photograph depicting a group of fishermen in Brazil is particularly notable (reproduced below), with its evocative mood of silhouetted people paddling boats across a glossy body of water into a hazy mist. Who are these people? Where these people going? Does it matter to us? 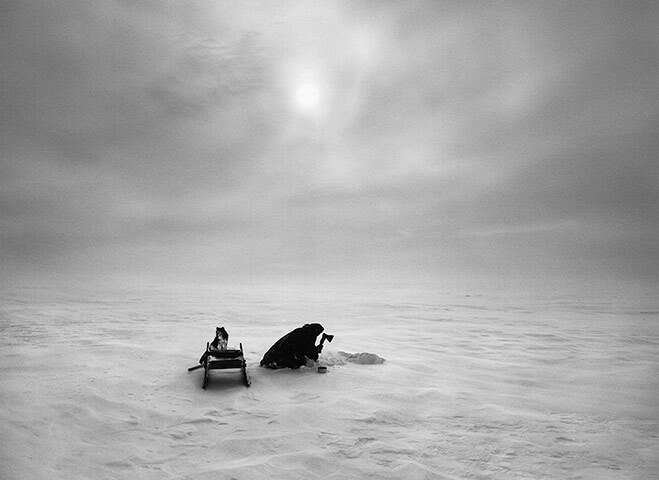 A photograph of a nomad digging through ice (reproduced below) evokes a mood of isolation, with its sole figure and dog alone against a white ground of snow and hazy sky. The presence of the photographer behind the camera fails to negate the overwhelming feeling of solitude that this work emits. This exhibition gives me a greater appreciation of nature and of its wild, varying beauty, and it presents powerful portraits of nature and of communities of people living off the land as one with it. The second exhibit, located in Leslie Sacks Contemporary, is smaller in scale but no less eye-catching. In contrast to the heightened natural world of Salgado’s black-and-white photographs, Jeremy Kidd’s “Temporal Excursions” bring our world to life in glorious color photography—with a twist. Each of Kidd’s compositions is a collage of photographs of the same subject taken at the same time, but the overall images are wonderfully, wackily distorted using computer software. The pictures are stretched together in inventive and surrealist ways. Columns are bent at odd angles; tall buildings form circular patterns. The images are odd, magical landscapes and urban scenes that are whimsical and visually thrilling. An early standout is “Oriental Pearl Pudong” (reproduced below), which presents a bright, shining night cityscape punctuated with dazzling blue lights. This exhibit presents a sort of “Alice in Wonderland” look at the world around us. Kidd transforms the mundane, such as beaches or night cityscapes, into fantastical images. 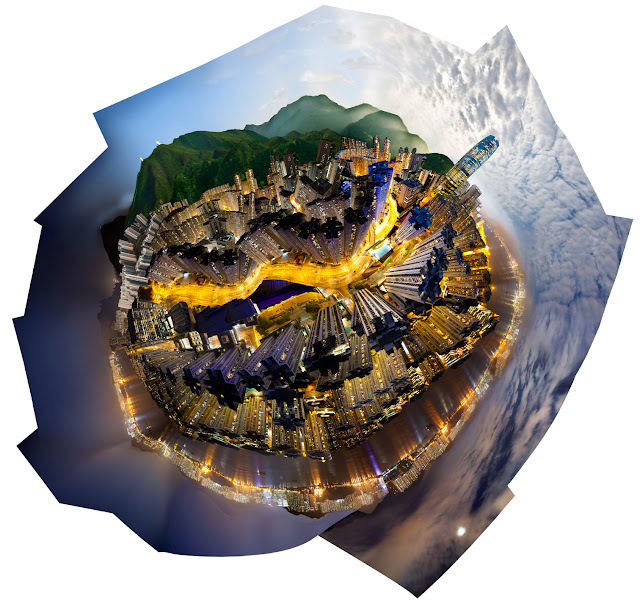 In particular, the wonderfully distorted “Taikoo Island East (Hong Kong)” (reproduced below) is a highlight of the show. What Kidd has done in this piece is compiled a series of photographs and stretched them over a globe shape, confining the landscape and urban scene into its own circular universe. The buildings and green mountain ranges seem to radiate from the center of this globular form. In contrast to the black-and-white photographs of the Salgado exhibition, the colors of Kidd’s images are saturated and glowing. This exhibit may be small, but it is utterly fantastic. Like Salgado’s work, Kidd’s photographs transform scenes we think we know into something else entirely magical. Nothing is as it seems, and nothing is expected. “Sebastião Salgado: Genesis”, located in the Peter Fetterman Gallery, runs from June 29-October 19. “Jeremy Kidd: Temporal Excursions”, located in Leslie Sacks Contemporary, runs from June 8-July 20. Both are well worth the visit! I love these mini reviews! You have done a great job of bringing the exhibits to life. Your enthusiasm for the shows is catching...perhaps another trip to Bergamot is in order! This is one of my favourite reviews. I don't know if you agree with me, but I love the solitude and mystery of the black and whites that totally contrast with the dynamism of the Kidd photos. And yet, there are similarities - like the focus on the natural, with the cities taking on the shape of mountains, and the buildings kind of looking like jagged rocks.